Open for the first time for 2015, we are so proud to introduce Bella Vista Apartments! 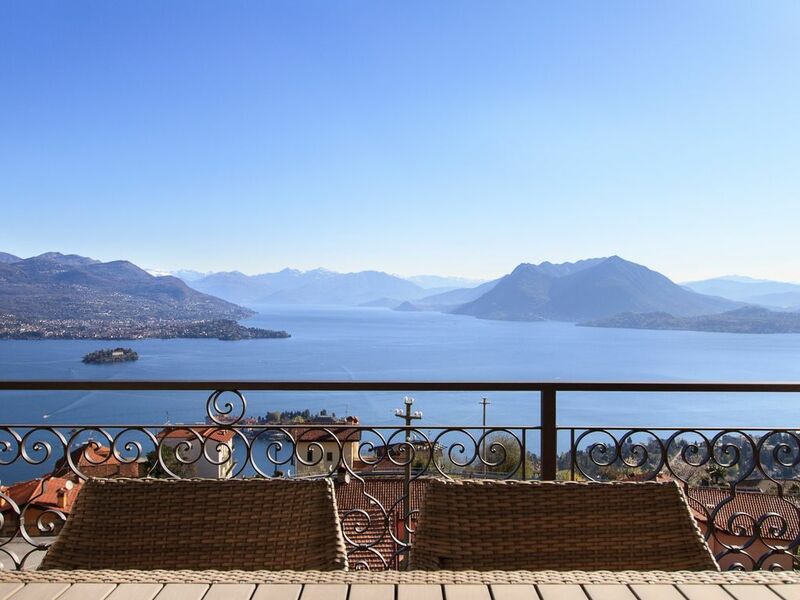 Five brand-new apartments, each with a private terrace with completely full, unobstructed views of Lake Maggiore. We have built these apartments with your holiday in mind. Designed with high-end features, multifunctional spaces, elegant bathrooms, and with free WiFi Throughout, the apartments at Bella Vista offer you privacy, relaxation, and convenience. There are ample parking spaces on the property, as well as common areas for sunning and barbecuing. Each apartment even Has Its own washing machine. Bella Vista Apartments are just above the charming little medieval town of Someraro, Which is a hamlet, village, of Stresa. Just a five-minute drive from the center of Stresa, Someraro is a perfect location to explore the area from Which. Adorable Someraro, With its narrow streets and picturesque houses, Has Two restaurants just a few minutes walk from the apartment. And Directly across the road from Bella Vista is the local bus stop, with service into town. The ideal spot from Which to discover Lake Maggiore and its beautiful communities, each with Their Own character and charms, and the perfect apartment to come back to and relax in at the end of your day. The open-concept living space Gives you a full view of the lake from the living and dining areas, as well as from the kitchen. The dramatic room divider wall is designed to look like the sail of a boat. In the kitchen we have designed a breakfast bar, I know That you can take your morning coffee while watching the sun rise. And later, end your day with a glass of wine while it sets. The modern kitchen is spacious, with a cooktop, oven, microwave, refrigerator / freezer, and plenty of storage space. There are dishes, silverware, pots and pans and all the utensils you need to prepare meals. Wine glasses too, of course! The living area Has a comfortable sofa That easily opens into a queen-size sofa bed. Surrounded by views all day, you can pull the darkening curtains to sleep at night. The dining area, in between the kitchen and living room, Provides a large modern table and chairs for indoor dining. The bedroom is large and tranquil. Curtains can be pulled to darken the room for lazy mornings. A full wall of closets offer all the space you'll need to store your things. The spa-like bathroom, Surrounded by elegant stone tile, features a large shower, all fixtures, and your washing machine. If you’re visiting Stresa this apartment is perfect! Modern clean and well appointed, with a available hostess on the property. Five stars. You will need a car. Thank you for your review! It makes us very happy that you enjoyed the apartment! New apartment with outstanding views. People pay premium for restaurants with a view. Here, it’s included. In fact we preferred to dine at home as none of other dining places can beat the view from kitchen table or balcony. And you just watch the sunrise and sunset, and full moon with a few bottles of wine.....and the bathroom is great too. We are so glad that you enjoyed the apartment and the views! We agree; it's a great spot to eat, relax, watch the changing light. Thank you for this review and your wonderful description of the apartment and the views! We hope that you enjoyed the herbs from our herb garden for your dining at home! We could not have wished for more. The apartment was beautifully appointed - light, airy, modern and comfortable. The full width balcony with fantastic views of the lake were simply magnificent. Stresa itself was charming. Would thoroughly recommend the apartment and the location. Thank you so much for your kind words. We agree; Stresa is so charming, and our view is always stunning. We're so glad that you enjoyed your time here, and thank you for your recommendation. Thanks Dana and Giuseppe for letting us stay in your wonderful apartment. We appreciated all your helpful advice and the many fine touches you included to make us feel welcome. The view of course, is to die for and the sun lounge and barbecue area up the top is just fabulous. We would love to come back again. Best regards. We're glad that the apartment was everything you expected! Thank you for this review, which will be very helpful to future guests, and please do come back again! Not only the view is outstanding, the apartment is perfectly equipped and beautifully decorated, a real home from home (even much better :)) and very comfortable. We were warmly welcomed by Dana and Giuseppe who made sure we had everything we needed and we appreciated very much the ease of communication by text message. We will certainly be returning again in the future and highly recommend their accommodation. Thanks for making our stay so seamless and perfect! Comfortable well-provisioned condo. Wonderful on-site owner-managers. A spotless well-provisioned modern apartment. We had a north view with a stunning view of Stresa, the lake, and the Borromean islands. Giuseppe and Dana (born and raised in Brooklyn – although she has lost her accent), the owner managers of this 6 unit property, are a lovely couple who are hands on from the moment you arrive until the moment you leave. They live in one of the units and have extensive knowledge of local restaurants and activities. Don’t let the map fool you, but you cannot walk to Stresa from here. It may be OK downhill, but uphill would ruin your vacation. Highly recommended. Thank you for this review! We're so glad you enjoyed your stay and we think this review will be useful to future guests. Bella Vista is four kilometers from the center of Stresa, uphill. That is how we have this amazing view! We recommend staying here with a car, and we have private parking for all our guests.